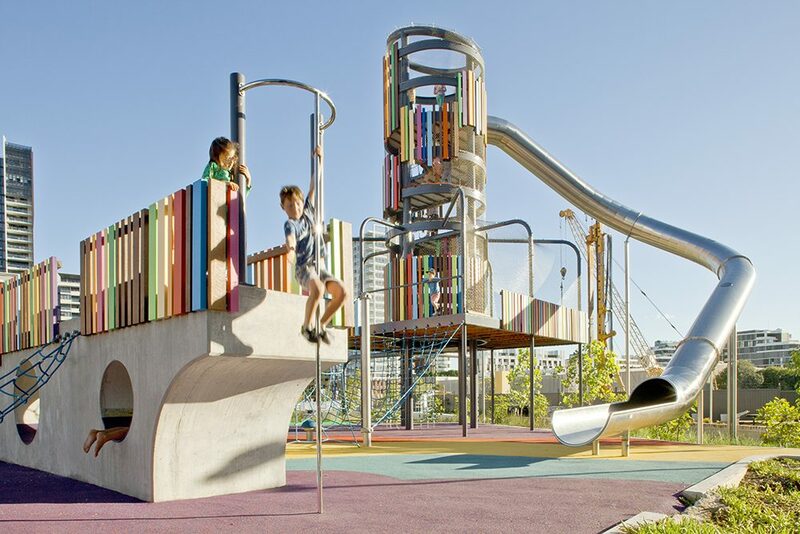 Tensile recently had the privilege of being involved in an innovative project at Wulaba Park, building a one-of-a-kind playground in the heart of a new development in Waterloo, Sydney. 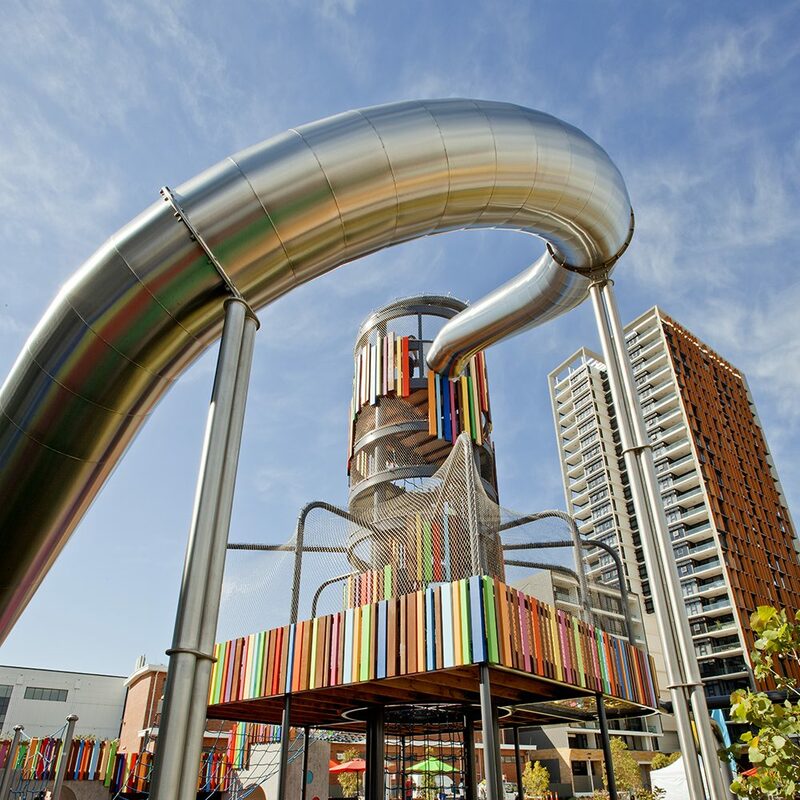 Located in the fast growing Green Square area, the playground features a giant slide, climbing towers, nets, tunnels and swings, and is the centrepiece of this child-friendly development. 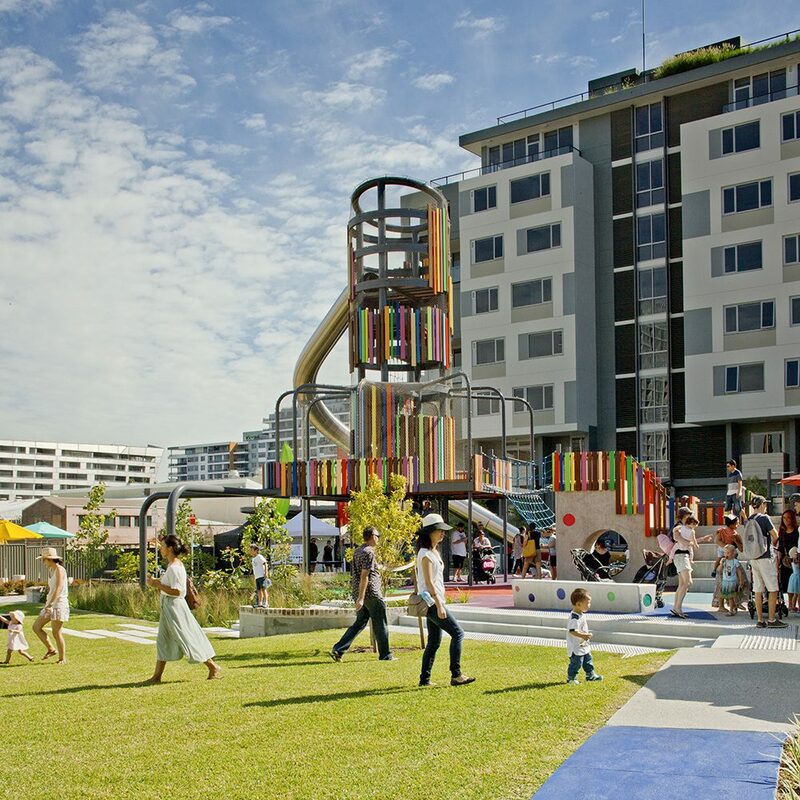 The initiative creates a beautiful brightly coloured space designed especially for families to enjoy. 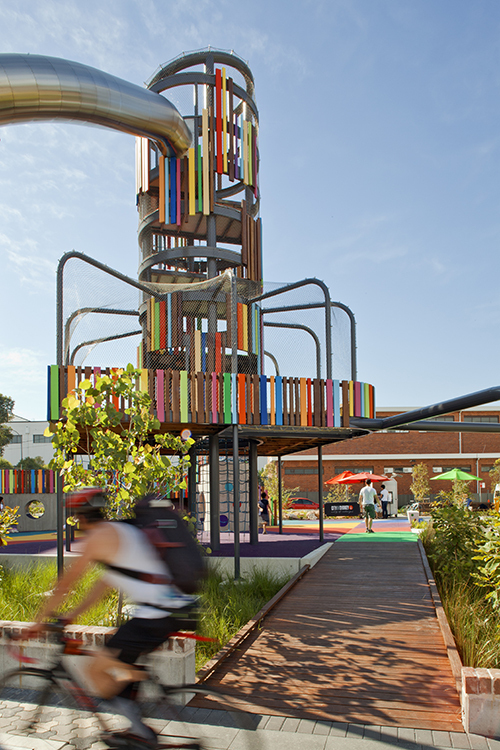 Working closely with Fleetwood Urban and designer Sturt Noble, Tensile was responsible for detailing, supplying and installing the Webnet mesh screen on the play area. Using such a small aperture mesh on a project is rare for Tensile, so we were excited to accept the challenge and work on something a bit out of the ordinary. The properties of the mesh work exceptionally well and provide an ideal solution for this project. This particular type of Webnet mesh was chosen because of its malleable nature and ability to wrap around the tower. It provides a high level of transparency and lightness, whilst meeting all the necessary Australian strength standards at the same time. 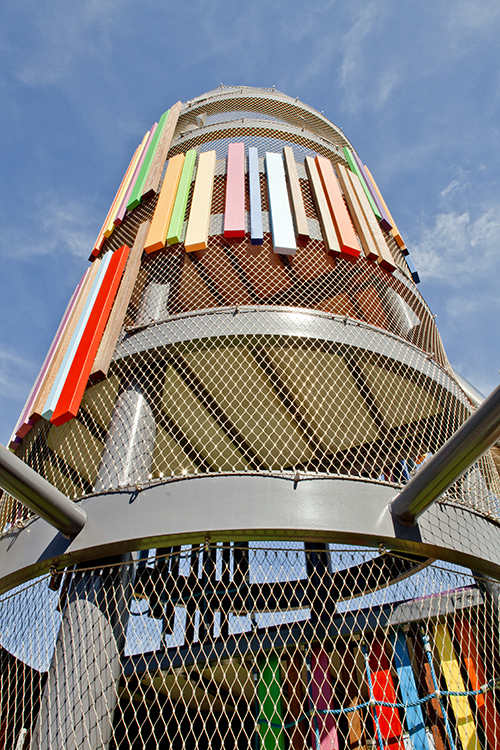 The mesh has variable aperture size openings, therefore meets the safety code for finger entrapment parts on children’s playgrounds. The flexible, fabric-like nature of the mesh allowed Tensile to wrap, configure and curve the steel around the platform so the mesh appears to be draped over the steel. The mesh for this project was left in its original steel colour, however it can be made into any colour required. The beauty of this material is it took just three days to install, is long lasting and virtually maintenance free. 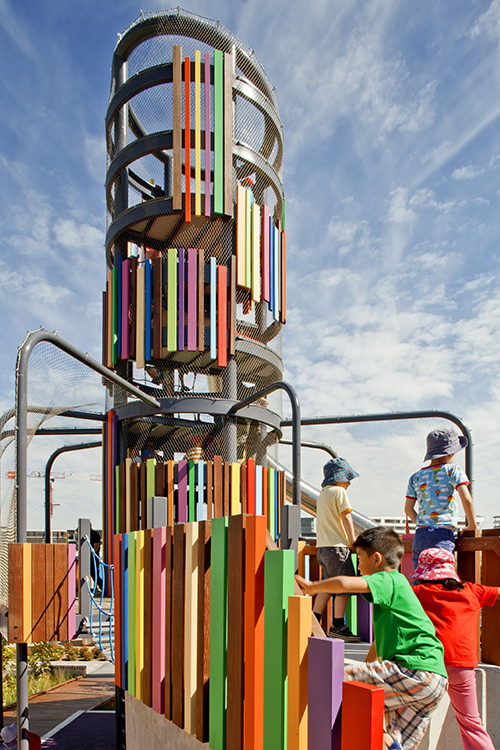 The unique and brightly coloured playground is designed to enhance children’s imaginations and encourage narrative based play. 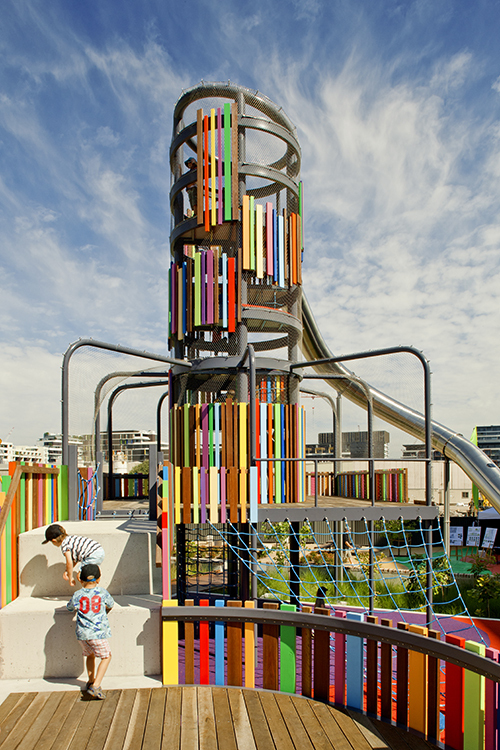 The design integrates public art by Nuha Saad, with a strong coloured pattern theme in the pavement and soft-fall areas.